Russia deployed unprecedented efforts to impress the airlines at the 50th Paris Air Show. The crucial innovations will not be unveiled, however, until Moscow’s MAKS show this August. 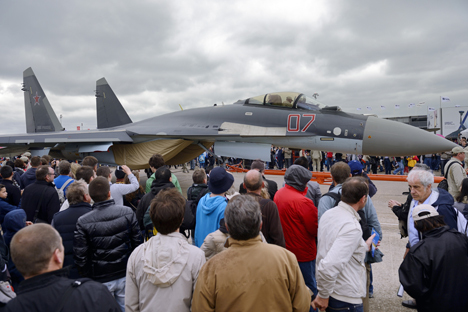 The Russian aeronautics industry delighted the public with its military aircraft, but it only sold a handful of civil planes to foreign companies. Meanwhile, the world’s giants — Airbus, Boeing, Embraer and Bombardier — each lassoed hundreds of contracts. UAC, the state-owned consortium that controls the main Russian manufacturers, aims to achieve a 10-percent share in the world civil aircraft market by 2030, against its current 1 percent. Nevertheless, its two main projects — the regional Superjet 100 aircraft and the future medium-range MS-21—have thus far received only a cautious welcome from the airlines; even the Russian Superjet 100 only won 20 orders at the Air Show, compared with orders for $700 million from the leasing company, Ilyushin Finance Corp. The MS-21 (which has not yet taken flight) received 30 orders amounting to $2.5 billion from VEB Leasing. In both cases, these were preliminary accords that will translate into firm contracts in late August, at the MAKS Russian air show to be held from Aug. 27–Sept. 1. “The Superjet’s success internationally will largely depend on how successful it is in use by the Interjet Mexican airline,” says Marc Sorel, director for Russia of the French company Safran, which supplies the engines for the Superjet. Interjet, which has just taken delivery of its first Superjet, is the only non-Russian company to have placed a significant order (for 30 aircraft). “The other airlines are waiting to see the Interjet’s results in operation before placing orders,” the company says. Thus, this is a crucial period for Superjet, at a time when the competition has launched a serious challenge. The Brazilian company Embraer announced its new aircraft at the Le Bourget Air Show; their plane will be in direct competition with the Superjet. The “E2” will come into service in 2019. Tensions emerged between Sukhoi and its Italian partner Finmeccanica, which is jointly selling the Superjet in markets unfamiliar to Russia. Finmeccanica’s owner, Allessandro Pansa, is considering leaving the project, while Sukhoi has expressed doubts about the efficiency of working together. “The question that arises in the case of both planes is their commercial success. The Superjet is already airborne, and the MS-21 project will be maintained to completion. But it is far from certain that these projects will be profitable,” says Boris Rybak, director of the Infomost agency. Respectively, $2 million and $4.5 billion have been invested in the two programs. At the Paris Air Show, the Russian state consortium RosTec (supplier of many components to UAC, including engines) revealed its aim of developing with the Austrian Diamond Aircraft Industries a range of planes with a capacity of up to 19 passengers. UAC currently has no project in the running for a range of aircraft with a capacity of less than 70 seats. UAC’s owner, Mikhail Pogosyan, recalled that there is currently a rapid increase in the rate of production of civil aircraft. UAC benefits from solid Russian government support, the state having ordered 400 aircraft for its various ministries. On Monday, June 24, Vedomosti revealed that an order of 100 MS-21s was being fulfilled for the Russian army, even though the aircraft has not yet flown. For the moment, the MS-21 has received a total of 253 orders — 135 of them firm. Thirty-five aircraft have been ordered that will be using the Russian PD-14 jet engine (which does not yet exist); the rest will be powered by the Pratt & Whitney PW1400G. The public unveiling of the PD-14 engine will be one of the highlights of the MAKS Air Show, which will also display the modernized version of the Il-76 (also called the Il-476)—the fifth-generation hunter. The MS-21 should win another 40 contracts during the show, according to the chairman of Irkut, the aircraft’s manufacturer. Oleg Demchenko stated that the IrAero companies want 10 aircraft, and 30 others will go to leasing companies — Russian ones, of course.